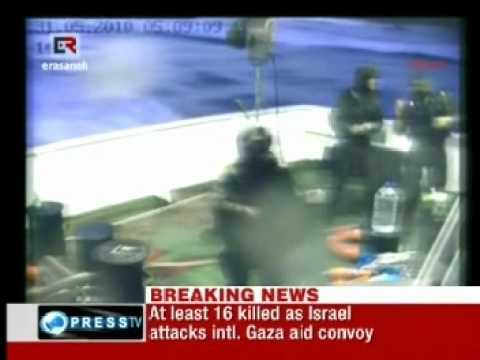 More than 20 activists where martyred and over 60 injured on Monday when Israeli navy commandos attacked a aid fleet that was going to Gaza. There where over 600 People in which different Parliamentarians, Journalists, NGO members from different countries where included. Pakistani famous Journalist Talat Hussain was also with the aid fleet. Israel has arrested all the people and taken them to Israel. Israeli Navy attacked the flotilla 65 KM away from Gaza in International Water that is also a Violation of International Law. United Nation, Turkey, Russia, Pakistan and different countries condemn this Barbaric attack on aid fleet. Many Countries have also called Israeli Ambassadors and condemn this terrorist attack on Aid fleet.